Make cake: In a medium bowl, combine rhubarb, brown sugar, and 1/4 cup flour. In another medium bowl, whisk 3/4 cup flour, baking powder, and salt. In a large bowl, using an electric mixer, beat butter and confectioners' sugar until light and fluffy; beat in eggs, one at a time. With mixer on low, beat in vanilla, then flour mixture. Spread batter in prepared pan. 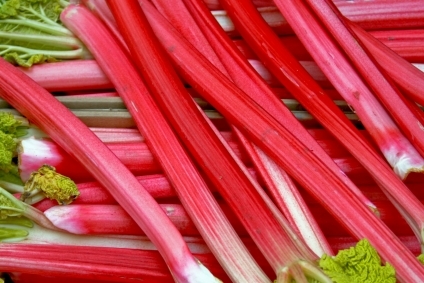 Sprinkle with rhubarb and top with streusel. I also tried another recipe from Martha for Rhubarb Meringue Pie. This was also a big hit! I used my own pie crust and made the rhubarb juice from a recipe I found on Cooks.com. If you get a chance to try either one of these recipes I think you will be pleasantly surprised. Cut rhubarb in 1 inch pieces. Cook until soft. Strain. Add lemon juice. Now it's time to make that pie crust...yummy!!! Cut the lard into the flour and salt until when squeezed in your hand the mixture holds it's shape. Add this to your flour mixture. Don't over work your dough. Form into a disk and put in the refrigerator for about a half hour. Remove from refrigerator and cut dough in half. This recipe makes 2 pie crusts. Put the other half in the refrigerator for a later pie. Or you could roll it out and put in a pie plate, wrap it up and freeze for another day. That's what I usually do. Anyways, place some flour on your counter and roll out your pie crust. Fold in half and place in pie plate. Trim the edges and crimp the edges. Dock the bottom of the pie shell. That means take a fork and put a lot of holes in the crust. Place a piece of parchment on top of crust bottom and pour some beans or pie weights on top. Bake in oven at 375 degrees for about 20-25 minutes. Remove weights and parchment. Return to oven and bake for another 5 to 10 minutes or until bottom is golden brown. Let cool. Whisk together 1 cup sugar, the cornstarch, and 1/2 tsp. salt. Whisk in juice, bring to a boil in a medium saucepan, whisking. Cook for 1 minute. Place yolks in a bowl and whisk; gradually whisk in the hot mixture a little at a time. This is called tempering. If you pour the hot mixture into the eggs all at once they will curdle. Once you have added about half of the mixture to the egg yolks pour it all back into the pan. Cook over medium heat, whisking, until thick about 1 minute. Whisk in butter and pour into cooled pie crust. Refrigerate until set, at least 4 hours or overnight. Preheat broiler with rack about 6 inches from heat source. Heat whites and remaining 3/4 cup sugar in a double boiler or a heatproof bowl set over a pan of simmering water, whisking, until sugar dissolves and mixture is hot (160 degrees), about 2 minutes. Transfer to the bowl of a mixer. Whisk on high speed until medium peaks form. Dollop meringue onto pie. Pop in oven and broil until browned, about 1 minute. Cinnamon Rolls - Just like Cinnabon's.... Absolutely the best!!! I also cleaned out the refrigerator and freezer. I found lots of fun stuff that really needed to be cooked before I would have to throw it away because of freezer burn. So first there were some shrimp. I thawed them out and made shrimp with tomato basil sauce with pasta (that will be another post, someday). I had that for super and froze the rest for lunches. I had a ham bone left over from Easter and lots of broth from roasts and chickens that I had cooked awhile ago. I threw them all together and made a wonderful bean soup. It turned out great. So I have super for tomorrow night with bacon, lettuce and tomato sandwiches and several individual servings that I will take to work for lunch. (My favorite lunch, bean with bacon soup and a braunschweiger and mustard sandwich)... My mom use to make them when I was little. When I eat them it reminds me of her. I also chopped up a bunch of rhubarb to make some rhubarb bars which I will have in my next post. This morning I woke up and went to church and then came home and decided to make my favorite cinnamon rolls. I love to bring them to work. It always puts a smile on everyone's face. I thought I would show you how I make my rolls. They always turn out and are such a treat. This recipe is a copy cat recipe for Cinnabon's. They taste just as good and the recipe makes 18 rolls. So there's always enough for everyone. I'll give you the frosting recipe at the end. In a large bowl make the pudding according to the directions on the package. Once it starts thickening, add 2 eggs, the melted margarine, the remaining sugar, the yeast and salt and mix really well. It will start looking a little lumpy, but that's OK. I usually add 5 cups of flour at this point and add the other cup while I'm kneading. Again, it looks kind of lumpy and messy, but that's OK. Start kneading. If you have never kneaded before, pretend like you are giving someone a massage. Work the dough with the heals of your hands. Keep adding flour until the dough is not sticky anymore. You might need even more flour to achieve a non sticky mass. That's OK. Just keep adding until it sticks together, but is not sticky. After a very short while, you will have a beautiful ball of dough that's not sticky. Oil (cooking oil) a large bowl and drop your ball of dough into the bowl. Flip it over and add a little more oil to the top of the ball and rub it all the way around. Cover with plastic wrap and let rise. I learned a little trick from Alton Brown. I'm sure you are wondering what the bowl is sitting on. It's a heating pad sitting inside a large casserole dish. This keeps a constant low heat on the dough and it rises much quicker. Once the dough has risen (about an hour or so), punch it down in the middle and let it rise again. The second rise will go much quicker than the first rise. At this point, put about a cup of flour on your counter and turn your ball of dough out on the counter and start rolling with a rolling pin. Your finished measurement should be approximately 36" wide by 21" long. Once the dough is rolled out, take about 1/2 cup of softened butter and brush it all over the dough. Then take about 2 cups of brown sugar and 2 or so tablespoons of cinnamon in another bowl and mix. Spread this mixture over the dough and butter. Then start rolling the dough into a 36" log. I use a measurng stick at this point so I cut the rolls equally. Each roll should be 2" wide and you should have 18 rolls when you are done. I also learned another trick from I'm not sure where, but it works really well. Take some sewing thread or meat twine and slice the rolls with it. Loop the thread around the dough and pull. It cuts them perfectly. ﻿Because you have 18 rolls when you are done it's hard to figure out what kind of pan to put them in. After many different trys, I finally came up with using 3 brownie pans. Each pan holds 6 rolls. You don't want too many more than that in each pan because the rolls in the middle won't cook completely and you will have a big doughy mess. Take your 3 pans and place a sheet of parchment in the bottom of the pan and place 6 rolls in each pan, cover and let rise one more time. Once they have pretty much risen to fill the pan, preheat your oven to 350 degrees. I bake each pan separately. I suppose you could cook them together, but I don't. Look how pretty and yummy!!!! They're the best! Place all the ingredients in a food processor and mix until creamy. Frost your rolls when they have cooled and enjoy! You will get a lot of smiles out of these rolls and once they bite into them they're eyes will tell you that you did good! Bread Making Basics by Connie Q....the best! Before Pinterest, I spent hours searching for recipes or videos on things that I would like to make, but didn't know how to do. I love to bake. The one thing I was not very good at was making bread. I wanted to learn more about it and see if it was really as hard as I had made it out to be. Well.... boy was I wrong. Like everything else it's just a technique. Once you learn the technique, bread making becomes so easy. I have become proficient in making bread and rolls thanks to the wonderful contributors from Pinterest and a wonderful website by Connie Q. I hope you try a few of these recipes. They are easy and taste so good. Your family will be amazed at your talent and you will be amazed at how easy it really is...enjoy! One of the first websites I came across for learning how to make good bread was ConnieQ Cooking...http://www.connieqcooking.com/how-to-bake-bread.html Her tutorial is wonderful. Her technique is easy. Please check it out if you are a novice and would love to make some good homemade bread and cinnamon rolls. Her website does not have any photos of the finished product, but has 4 videos showing you step by step how to make bread from start to finish. Thank you Connie... I finally learned how to make good bread from your techniques!!! My husband's 60th birthday was in March. I decided to have an Italian dinner for family. I started with a Chicken Alfredo Lasagna recipe from Pinterest. I made a great green salad and then I added Crusty French bread. I found the recipe on Pinterest, of course. This was without a doubt the easiest recipe I have come across to date. The bread turned out beautiful. I made several loaves and the family loved them. There's nothing better than warm crusty French bread with butter.... yummy!!!! She has a great tutorial on how to make this bread. She does a wonderful job showing you step by step. Check out her blog for this great, easy recipe..... you won't be disappointed! Last week I came across a bread recipe on Pinterest that intrigued me. It used only flour, yeast, salt and water. How simple! It did however need to be cooked in a cast iron dutch oven. I didn't have a cast iron dutch oven so I was on a quest to find one. The gal on the blog was using a Le Creuset 5.5 quart dutch oven. These puppies are really expensive. I found this ad for them on Amazon. The best price is $34.73, which is not terribly bad. I do use mine all the time. 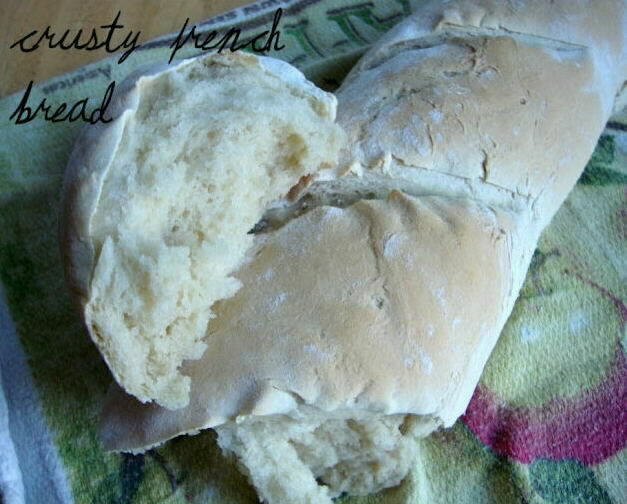 It's great for soups, stews and of course 4 Ingredient Over-Night Bread! According to the recipe you have to leave the dough on the counter overnight. So last night I mixed up the dough which took about 2 minutes and went to bed. This morning I baked the bread in my new cast iron dutch oven. OMG!!!! this bread is unbelievable. It is like an artisian bread. It is crusty the way I like it and wonderful. This bread was without a doubt the easiest thing I have ever made. The taste is out of this world. The recipe came from http://simplysogood.blogspot.com/2010/03/crusty-bread.html Janet has many variations to make from this simple recipe. 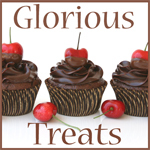 Check out her blog for more ideas on adding different ingredients. I checked out all the comments on her blog and everyone is in agreement that this bread is wonderful. Some of the variations are...sharp cheddar, Rosemary, lemon and gruyere and cranberry, orange and almond. You could make your own variations.